A CRM is one of the most important decisions a REALTOR can make because it literally runs your entire business in terms of managing all your contacts, marketing, follow up, lead conversion and more. The problem is there are so many CRMs to choose from, choosing the one that will run your business can be a pretty daunting task. 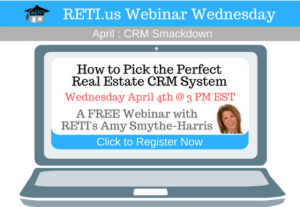 To kick off RETI’s CRM Smackdown Webinar Series, Amy Smythe-Harris, managing broker of a virtual real estate company, 20+ year veteran of the industry and user of many CRM systems is here to help as she will give you several tips to help YOU Pick the Perfect CRM for yourself, team or company. Watch the How to Pick the Perfect CRM Webinar Now!